It seems to me like people who did well at this worlds are much more likely to get a place than any other. Why? The gold events are the same and lifters will peak for next worlds again. There are 56 lifters per gender. Top 8 x 7 Olympic categories = 56 lifters. What happens to the top 8 of the other categories? There will be some overlap. As an example, Lidia is the top 81 as of this moment, but will be aiming to qualify for Tokyo as a 76. Qualification in a nutshell: lifters have to do 6 international competitions in the qualifying period, minimum of one in each qualifying period, at least one gold and one silver/gold. Final ranking is based on four results; top result from each six month period, and the next best result; two of these four have to be in the Olympic category they intend to compete in come Tokyo. So the top lifters in any non-Olympic categories will have to compete at least twice in an Olympic category in an attempt to crack those rankings if they want to compete in the Olympics. But in your example - if Valentin ends up top 8 in two categories - she would be scratched out of one, likely the lower ranked, would she not? So that the 9th place moves up in the rankings. Surely you can't qualify twice? The bigger question is perhaps: how do you prioritize? There will be 80 top 8 rankings, how do you get to 56 without shafting some? Yes, there will be overlap, but surely not exactly 24 names!? She would get the placing for her highest ranking in an Olympic category. So, in both of your examples, her ranking in the 81s would get scratched because that's not an Olympic category. The rankings at 81 won't matter for Olympic qualification, but ROBI points earned in competition as an 81 can be used towards qualification in a different class. If you had a female lifter competing at both 55 and 59 during the qualification period, she would earn a quota spot in whichever category she is ranked highest, because they are both Olympic categories (provided she participated in at least 2 competitions in each category). No, there probably wont be exactly 24 people's worth of overlap. 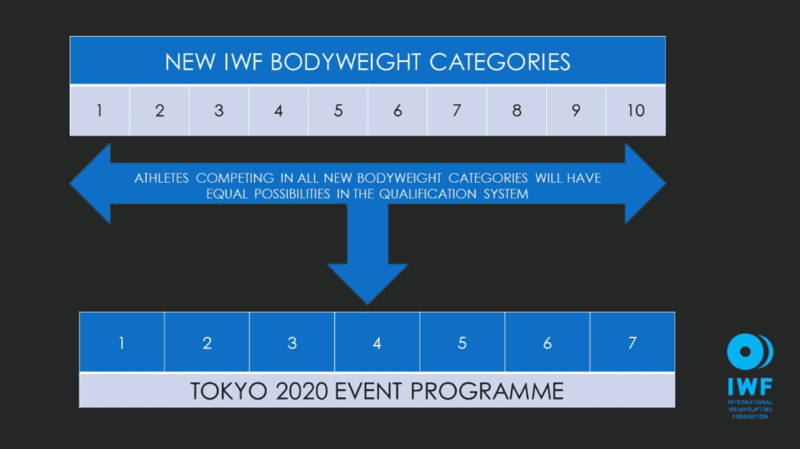 There will likely be some lifters from the non-Olympic categories who are unable to rank high enough to qualify for Tokyo in an Olympic category. Well the mascot has been unveiled. Last edited by Hawkpeter; 04-01-2019 at 01:46 AM.